Secotan was a large village of Algonquian-speaking Indians that was encountered in July 1585 along both banks of the Pamlico River by Sir Richard Grenville, an explorer sent by Sir Walter Raleigh. 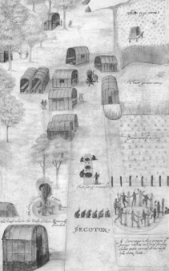 The village was documented in a detailed watercolor drawing by John White in 1585-86. Titled "Indian Village of Secotan," the drawing depicts a well-ordered village with family units, storehouses, fields with growing crops, and individuals performing different tasks. In 1690, Bath, the first town of English settlers in North Carolina, was established in the vicinity of Secotan, which had been abandoned by the Indians. Paul Hulton and David B. Quinn, The American Drawings of John White, 1577-1590, vol. 1 (1964). Quinn, The Roanoke Voyages, 1584-1590 (2 vols., 1955).